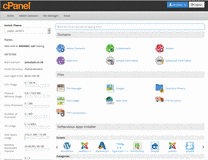 cPanel is a fully featured Web-based control panel that allows you to manage your hosting package through a web interface. The idea is to transfer as much of the control and responsibility of managing your website to you. You have the ability to manage all aspects of your hosting package, for example: email, files, backup, FTP, Softaculous scripts installer, and website statistics. cPanel with Paper Latern template.